On this episode Steve Tuma, president of Landmark Home and Land Company, reviews questions about plans and design. How to visualize your home so you know its what you want. What is mechanical design? Why do building departments require so much information to issue a permit? What if your building department does do a plan check, meeting code regulations, and more. Interviewer: Hey everyone and here we are again for another episode of the Panelized Prefab Kit Home Building Show and with me is the President and Founder of Landmark Home and Land Company, a company which has been helping people build their new homes where they want exactly as they want across the nation and worldwide since 1993 and that man is Steve Tuma. How are you doing, amigo? Steve Landmark: Excellent. It’s a good day. What do we have? We’ve got more interesting questions. Interviewer: I always have interesting questions. What are you talking about? Steve Landmark: Panelized home questions, prefab home questions. Interviewer: Every question I ask is interesting. Today though I wanted to talk a little bit more about plans. We’ve touched upon them in the past. But I want to talk more about like mechanical design and building department information, how to get that to them in the correct way and permitting. Every time we talk about that stuff, I learn something new. So I would like to start off asking you about architectural plans. Now every time I see a set of plans, architectural plans, they’re nice and they show a clean 2D version of the home that I want to build. But I can’t seem to look at that and visualize what it would be like to live there in real life. You know what I mean? How can I get a better vision of the home I’m eventually going to move into? Interviewer: Sort of an animation kind of thing. Steve Landmark: Yeah, in a sense an animation where we could show all sides, the top, the bottom. Steve Landmark: You know, different things. You can go in the house and see how the house is laid out with furniture, where the windows, wherever you might be. Steve Landmark: So we’re able to do that and go through and really lay it out. It’s a pretty spot-on method of being able to go through and eyeball and make sure it’s right. Now when you do that, it takes a little bit more time to properly detail it and make sure the colors are right, make sure just everything is put together. So it won’t be 100 percent perfect because we’ve been doing this and sometimes people say, “Well, I see the couch in the room. But it’s not my couch.” Well, it might be hard to get your custom couch rendered but we can get a representation in there, so you can get a feel for the size of the kitchen. Steve Landmark: How the kitchen would flow, what it would look like from a perspective, what it would look like with a certain size couch or how your TV fits. I would add a little bit more time for the design elements because it takes time to do that and revise it to make sure you can see exactly what it is. But that’s one of the key elements of how we’re able to help you at Landmark Home and Land Company is let’s design what you want and then make sure that you know that that’s right. Steve Landmark: Hey, things like that happen. It’s kind of amazing and if someone is really, really into their home, their environment, where they’re going to live, it can be a valuable process to go through because that – then you can – it’s kind of like sitting in your home. You could see it. You can see a picture. You can see how the room flows, how the house flows and then we’re also doing 3D floor plans like cutaways, so you can see how different pieces of furniture lay out, how the house flows. Interviewer: Exactly. Because I know real estate companies are doing that more and more as well, using 3D graphics to do house tours. I think that would be amazing to have that, just so you could get the look of how your home design is kind of going to feel. Steve Landmark: Well, we’re kind of living in a virtual smartphone world now. I mean you see it. People are driving down the road, texting, talking. People are sitting in the house. They go to dinner. They’re spending time on their phones. They’re on buses going to work or in traffic jams looking at different stuff. So that we’re able to help people visualize their home better. Interviewer: Yeah. We’re seeing people in cars texting and they’re not even in the driver’s seat. There’s no one in the driver’s seat. Steve Landmark: Yeah, all that – yeah, that’s the technology we live in and that – this 3D rendering situation is kind of the same thing. Twenty years ago, it just wasn’t as good. But now, now you got it where it almost looks just like a picture. Steve Landmark: You know, the saying, you know, instead of a house, it’s a home type of a thing. So we’re able to do things like that and make sure that you end up with the house you want. If someone is really, really into the architectural design of the home, it’s worth doing just to make sure that you’re building exactly what you want. Interviewer: Let’s talk about other design elements. How do I get my electrical, my plumbing, my heating, air conditioning? Those systems need to be designed as well. Is that the same sort of process as the – you know, putting up the walls? Steve Landmark: Well, it’s – the actual design process is similar. It’s done on CAD. But it’s different disciplines in a sense. So designing the wood structure of a home is different than an electrical system. But there are a couple of answers to that. There’s the design. So they have the proper design for permitting. Sometimes they want to go through and make sure that you’ve got the right sockets per code or the right circuits. You know, smoke detectors, CO2 detectors and different situations like that. But then some building departments get a little in depth by going through and wanting the complete electrical design calculation riser diagrams, to make sure that for the house that you have, you’ve got enough “juice” going through it. Steve Landmark: So there are more and more places asking for that. So typically we will supply an electrical layout showing where the sockets are, different simple details that an electrician can use to build. But if for some reason your building department needs more sophisticated details, we can go through and do the electrical engineering for that house as well. Now that goes through the plumbing. A lot of people say, “But doesn’t the plumber just know how to put it together?” Generally they do but a lot more building departments want to make sure that your gas piping is right, that it’s the right size so that gas can go through and get properly distributed to the different appliances in the home and that it’s also the plumbing. Make sure that the water lines are properly sized and going to the right location. Some people are getting in split gray water systems for reusing water for landscaping outside and different details. The one that we get more request for is the HVAC, heating, ventilating and air conditioning systems, where they want the manuals to go through to make – see the heat loss calculations, make sure your furnace and air conditioning unit is sized right and then also make sure the ducts are properly sized so that the heating and cooling is effective. So we can take care of all of that to whatever degree a typical building department would request and it is very important. A lot of people say, “Yeah. But doesn’t my heat guy just go and put this in?” and it’s like, “Yeah, I’m sure he can. But it’s almost like asking someone else to shop for your shoes.” You can say, “Hey, I need an 11 wide,” but different manufacturers of shoes, their 11 wide fits a little different. So it’s the same thing with the furnaces, that they’ve got to be designed ways for different climate, for different uses and it’s an important process to make sure it’s put together because if a furnace runs too long or too short, it’s burning energy. Interviewer: And Landmark can pretty much get me through all of those processes, right? Steve Landmark: Oh, yeah. We can help with pretty much anything that you would need for the building permit, to make sure it’s put together properly and then it’s easy to obtain permits and then the – it’s properly designed so that you know when it’s being built, you’re getting the best possible. Interviewer: Now, we’ve talked on the show in the past about more green living and let’s say I build a house. Then five years from now, I love my house but maybe I want to install solar panels to the new home. What do I need to do? I mean do I need to think about that early or after it’s built? If I just said I want to do something like that, well how tough is that? Steve Landmark: Well, it’s kind of an interesting concept. It can affect the actual design of your house and it also will affect the loading of the roof system because your roof is designed to carry a certain weight. So let’s just say the snow load is 20 pounds per square foot. It will hold 20 pounds a square foot. But if you go stick a solar panel on there, generally the engineers allow 3 pounds per square foot. It’s additional weight that’s always up there. So a lot of people will say, “Hey, what’s the roof loading that I need?” and I will say, “Well, 20 pounds,” or 50 or whatever it is for your area. Then they put solar panels on there and they don’t add for the solar, the weight of the solar panel, the point loads of holding it in place. Interviewer: Explain that. You mean the actual where it’s placed on the roof. Steve Landmark: Right. Where it’s placed on the roof so that the solar panels have maximum access to sun. So a lot of people say, “Well, it’s no big deal. I will just put the solar panels on the south side of my house?” Well, what if you had a gable-end home where the gable face south. Steve Landmark: And the planes – I will say like a roof, a 6/12 roof pitch or so face the east or west. You’re not getting the optimal southern exposure. So sometimes when you’re looking at this, you have to reorient the house or redesign the roof to take advantage of the roof panels. Some states are starting to mandate solar on houses or at least put it in there, that the roof system has to be able to support the solar. I mean some renewable energy systems. So there is a little bit of an art to it. You can’t just take any site and put it in any house site and go, “Wow! It’s solar.” Well, it may be able to hold the solar panels. But are the solar panels oriented properly to accept the sun’s rays? So that’s kind of a situation. To cut to the point, you kind of want a big plane out of the roof that faces south. That can do it and there are solar design situations. We can help with that, to go through to make sure that there’s enough space for the solar to be collected and then the system to be put in place. So it’s a little bit of work. You will notice that on some houses, they will try to put solar panels up and it’s just in the little section. Steve Landmark: Even though the roof may be huge, it’s just in a little section because that’s the only spot where it will actually do something and be able to collect the solar rays. Interviewer: Another thing that you’ve kind of gone over in the past is energy calculations. I’ve heard you talk about that a few times. Exactly how do they help me to save money? Is it really worth it, all of those calculations, energy calculations? Steve Landmark: Yes, it is important. The reason being is it’s a theoretical calculation where they can go through and say, “Hey. For your house to meet code, you need to have certain insulation on the foundation, the floor, the walls, the roof,” and also some of them get very in depth into the type of duct work, the energy efficiency of the furnace and the hot water heater. So a lot of people say, “Well, hey, I went out and I got the most efficient furnace. What better can I do?” Well, what they don’t realize is that if that furnace is not installed properly, you won’t be getting the proper efficiency out of it. So the idea is way back 20 years ago, 80 percent efficient furnace was you stick a dollar of gas into it, You get 80 cents of heat out of it. Now they’re higher percentages, 96, 98 percent efficient. So you stick a dollar into it of fuel. You get 98 cents of heat. That’s a better return than way back. Steve Landmark: So what ends up happening is you heat or cool and then you distribute it through duct work, metal duct work. If that duct work isn’t installed properly, there could be tremendous loss in the heat. Kind of a similar concept of having a garden hose with a bunch of holes in it. Steve Landmark: So you could be running water through it. But because there are so many holes in it, the water is coming out of the garden hose instead of at the end of the spigot where you want the water to wash your car or water your yard. So it’s the understanding of how the heat transfer happens in the home but also gets into the design to make sure that the heat systems are put together properly or using efficient water heating. A lot of places, the codes pretty much dictate that you have to have instant hot water heaters. There’s just a lot of details that you’ve got to go through. Even insulating a crawlspace or a slab, there’s a lot of heat lost through ground or cold coming in or heat coming in. I’m talking a lot about heat and a lot of parts of the country, they’re trying to keep houses cool. Steve Landmark: So it works kind of both ways. So it’s not just to save on your heat bill. It’s also to save on your air conditioning bill. So that’s part of our design process is looking into the energy efficiency, the theoretical efficiency. But then you have to go through as our owner builders do and make sure that it’s installed properly, make sure that the insulation contractor knows how to properly install, make sure that the heat guy is doing it right. You can get HERS raters and they’re able to go through and make sure that the installation matches the energy codes. That’s one of those things that you can’t really see the value until you get your energy bills. So it makes sense to make sure that it’s put in. A lot of people go through and say, “Oh, I got to make sure my windows are installed right,” but very few people go through to make sure their furnace is installed right or make sure the insulation is installed right. Your energy bill, that’s a monthly bill. Steve Landmark: Your happy electric company and gas company just seem to be able to send you a little wake-up notice every month. So the lower the dollar on that, the better off you are. Interviewer: I think you were right earlier when you said that there really is sort of an art to making a home efficient. It really is something that I don’t think enough people probably put any thought into at all. It just doesn’t happen. When people are buying and selling homes, the pictures don’t show the cost of ownership. Steve Landmark: The pictures don’t show the value of a quality home. They show you a cute kitchen or a bathroom or porch or whatever it may be. That’s very important to do. But the cost of ownership and comfort in your home I think is equally as important. Interviewer: You touched on something a little earlier but it just struck me as something – it has got to be so important. The actual placement, the orientation of your house to the sun must affect the energy efficiency of your home. Steve Landmark: Oh, yeah, Steve. You’ve probably been in a situation where you’re – you know, say you’re at a restaurant and you’re sitting there and you’re by a window and the sun is just beaming in. It just seems to be so much hotter right there. Steve Landmark: Than if you went to a shadier part of it. A lot of people think, “Oh, I will just turn my air conditioning on.” Well, it costs money to do that and it’s still going to be warmer. So yes, orienting the house in different ways can allow it to absorb that sun or to be shaded from it. So that actually can get into the energy calculations of a home to see the energy efficiency because a lot of people, they will go through and someone will say, “Well, I think I need a two-ton air conditioning unit,” and they didn’t look at a 20-foot wall of glass that’s 10 feet wide. That’s essentially like a magnifying glass, just letting the sun rays in your house. So if the energy calculations aren’t done right with – taking in the consideration of the orientation of the sun, it may be undersized because it can’t overcome the heat that’s generated from that glass. On the flip-side, that glass is not as good of an insulator as an R-30 or R-21 in a wall. So your heat system might have to be a little stronger and have different ducts in different locations to counteract the glass that isn’t as good of an insulator say in the cooler months. Interviewer: Yeah. I don’t know. Having Landmark around to deal with all these little details, I just don’t see why anyone would want to go into home building without having somebody like you there. I mean it just seems so intricate. Even I’m thinking about the shading and the design of the house itself, like overhangs. I mean how do overhangs affect the energy consumption and how comfortable my house is? Steve Landmark: Well, that’s the situation where the overhangs can dictate how much sun gets in. So depending on where you are in the world, the sun is going to be higher or lower in the sky. Steve Landmark: So if you have a longer overhang like in summer, it will protect the house, so that the sun can’t get into your windows as much. But then when the sun is lower in winter, it allows the sun to get under the eave and into the house. So in a sense, that situation that we’re talking about, about the big glass wall, we’re taking advantage of the sun by allowing it to come through and heat the house in certain seasons and with bigger overhangs, the sun can’t get in as much. So like in summer, we’re not adding heat to your house through the sun. Now, as you probably noticed, you open your window on a winter day. It’s chilly in your house. The sun comes in. It gets warm. That’s free. So that gets in the – you know, some organic design situations and the orientation of the house and picking window sizes and overhang sizes if someone chooses to get into that situation. It’s a little harder to work on when you’re like in a small city lot because you can’t really change the orientation of the house. But you can do design elements to take advantage of that and especially if there’s land where you have a choice of orientation and different situations. It can be done. It’s pretty amazing. Interviewer: I have one more question for you. I’ve been saving this for last because I’ve been hearing people talk about thermal mass. Would you please explain to everybody what the heck is thermal mass? Steve Landmark: Thermal mass is basically a – it’s something that will absorb heat or cool. So I don’t know if you’ve ever stood by like a stone building after the sun is on it. It might get cool at night but the stone holds that heat and then at night radiates it. So not too many people are building true stone homes today. But what they’re doing is developing a thermal mass. So just like we’re talking about the sun coming into a house, OK, so that sun comes into the house, goes through a piece of glass. If it hits a cement slab, that cement slab will then act as a thermal mass. It will absorb the heat through the day and then at night slowly release it. All of us have seen a lizard on a rock. The lizard is taking advantage of the heat that that rock is holding even on cooler days. Steve Landmark: So the thermal mass can be a cement floor. It can be a masonry wall. It could be a variety of different situations. So when you get in a different design element, sometimes people will go through and say, “You know what? I’m going to just have a cement floor, color it.” It’s beautiful. It’s environmentally-friendly. It’s not holding the allergens and dust and everything of carpet. But it’s also a thermal mass and we can actually calculate how far into the house that would need to go, to effectively soak up the sun rays. So that’s what it is. It’s kind of like a heat sink. It will hold hot or cold and then absorb during the day, release it at night in the case of heat. It’s a pretty interesting concept. It has got to be designed properly with the right types of materials. But it’s kind of an interesting situation. Steve, next time you’re walking by a building at night and it’s a little cooler outside, touch the stone building or masonry building. Steve Landmark: It will be warmer. That’s the heat from the day being released at night. Steve Landmark: That’s the action of a thermal mass. Interviewer: Well, I don’t know of anybody who could have explained that to me better. Steve Landmark: Yeah. It’s the lizard on the rock. That’s where it got you, right? Interviewer: The lizard was perfect. Interviewer: So, well, once again it has gone by super-fast. 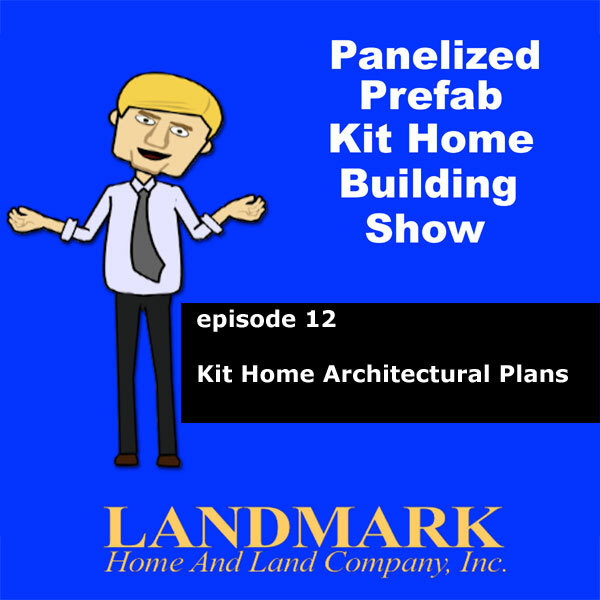 But we are done with another episode of the Panelized Prefab Kit Home Building Show and I just want to take their opportunity to allow Steve Tuma of Landmark Home and Land Company to tell us the best way to contact him and his company. Steve Landmark: The best way to get in touch with us is – you know, I think people should preview the website, www.LHLC.com. It’s kind of like the initials of Landmark Home and Land Company. So www.LHLC.com. You can also call 800-830-9788 and we answer the phone. We will take care of you. Have a nice discussion to find out what it is that you need, how we can sort this all out, figure out how your house fits on the land, what type of design you want and get you going in the right direction and then make sure that we can help you. We’ve been helping people for 25 years all over the country and below sea level, above sea level, the highest populated city in America, Leadville, Colorado and cities, country, whatever it is. I know we can help you out. Interviewer: Excellent. This has been a great show. I really enjoyed it. So everyone, thank you once again for joining us on the Panelized Prefab Kit Home Building Show. So from myself and Steve Tuma, President and Founder of Landmark Home and Land Company, thank you for joining us and we will see you next time.